Dental365 University sponsored an exciting day in New York City, on July 11, 2018, welcoming Gordon Christensen, DDS, MSD, PhD to present the Christensen Bottom Line. All Dental365 doctors were in attendance for an educational, exciting and engaging presentation about the latest topics and changes in dentistry. "Dental365 is committed to providing our doctors the educational tools that are needed to provide our patients with the best care," said Dr. Scott Asnis, Founder and CEO of Dental365, "...and we are committed to making the experience enjoyable and entertaining at the same time." Dental365 University was developed as a highly-focused educational initiative that provides our dentists with a continuum of knowledge, mentorship and professional development. It is a unique platform to allow each provider the ability to engage with his/her colleagues and peers to collaborate in a team-oriented atmosphere. This helps improve care for patients and enrich our doctors to learn cutting-edge, evidence based treatment and techniques without the need to travel or enroll in 3rd party courses. 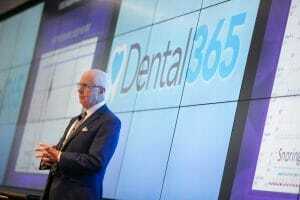 Dental365 University will continue to grow and improve to fulfill the needs of our doctors and patients. The program is catered to each provider’s needs, and future modules can be created at the suggestion and guidance of our team doctors. Doctors at Dental365 have a voice in their future learning experience.